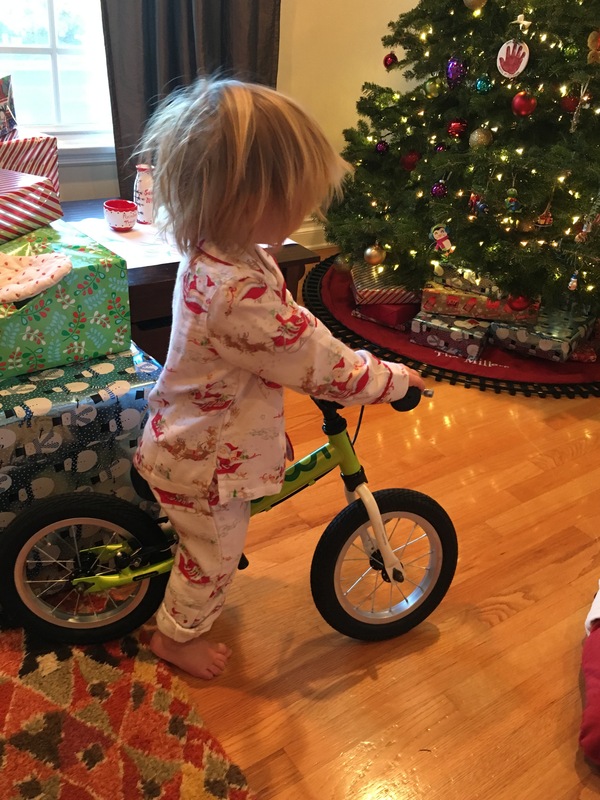 So first things first, why a balance bike?! After a ton of research, we decided to get a balance bike for A for a couple of reasons. It’s WAY easier for toddlers (2 years old especially) to coordinate riding a balance bike as opposed to pedaling a tricycle. I found that any time A would try to ride a tricycle his legs were never quite long enough to make a full rotation on the pedals, and once he could, he would get tired very quickly and then we would be stuck two blocks away from home with him too tired to pedal, yet too stubborn to let me help push him along. This usually happened without fail at like 4:30 pm when he was equal parts tired and hangry. It’s way easier for them to learn to ride a “real” bike, and often times they don’t ever need training wheels. Because they are learning the “hard part” balancing on a two-wheel bike, once they are old enough, all they really need to do is add the pedaling and they are golden. Also added bonus some bikes like the Yedoo Too Too have a hand brake, so they can also learn how to use that on the balance bike as well. It builds core strength and balance which helps in life and sports later on. No matter what your little one goes on to be interested in, having a strong core and great balance is something that will benefit them throughout their lives. You can’t go wrong here. They are WAY more likely to be able to keep up on a family bike ride. Seriously, A has had his balance bike for 6 months and he already flies on it. You can only go so fast on a tricycle. Seriously, I’ve tried…you can pedal your heart out, but you are NOT going to keep up with a real bike. It’s a frustrating reality. 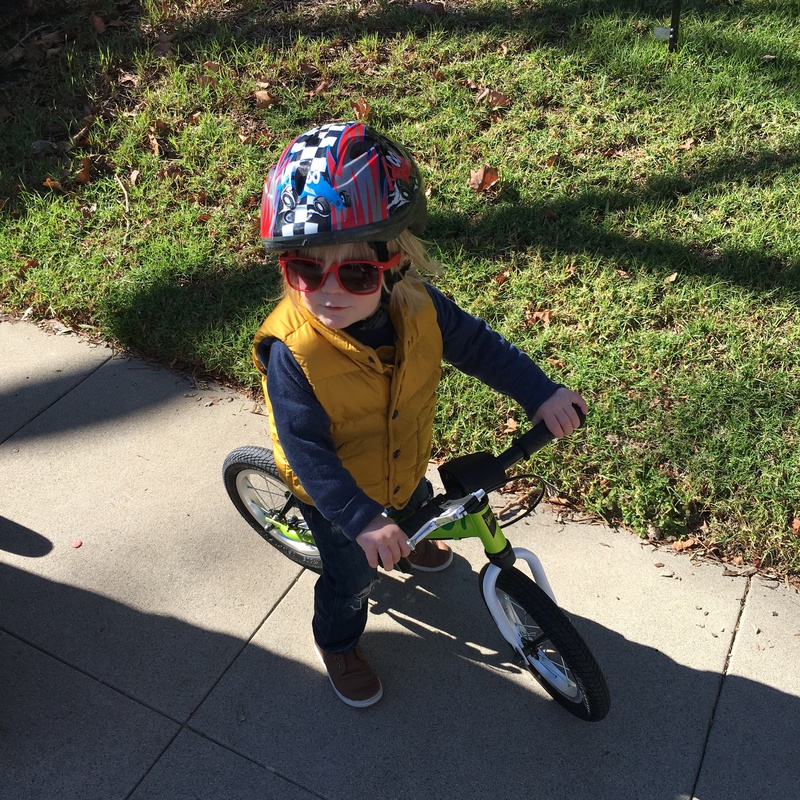 However, on a balance bike, your kiddos stand a chance at being able to follow along on a family bike ride around the park, the neighborhood or just up and down the street with the other neighborhood kids. 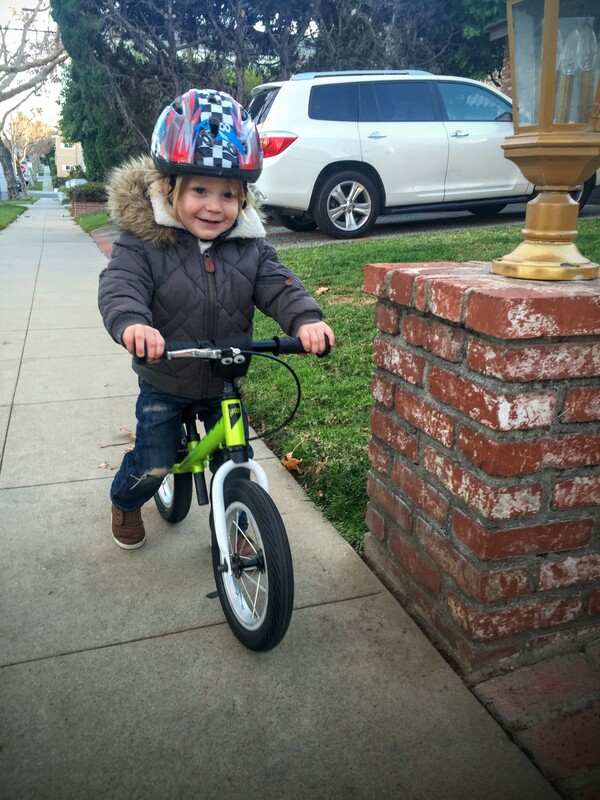 Ok, so now that I’ve convinced you how great a balance bike is…how did we choose ours?? Simple. I found this AMAZING website that is 100% devoted to kids bikes and picking the right bike for your little one – www.twowheelingtots.com. Literally, they eat, sleep and breathe bikes for kiddos. What I found interesting was how important getting the right brand of bike for your kiddo was, and how it’s not one size fits all. Each brand has a different ideal height and weight for their bikes, and picking the wrong one can be the difference between your little one LOVING their bike and being insanely frustrated by it. Here are the general guidelines for picking the right bike. Your kid’s weight. Some bikes are heavier than others. If you have a featherweight and you put them on a very heavy bike, they will have a hard time managing it. Having a lighter bike makes it easier for them to ride, carry, balance on, and maneuver. According to Two Wheeling Tots, you don’t want the bike to be more than 30% of their body weight. Also, a lighter bike means that it’s less for you to lug when your toddler gets tired or just well, decides they don’t actually want to ride their bike anymore. Bike tires. Tire size can range from 10 inches to 20 inches. 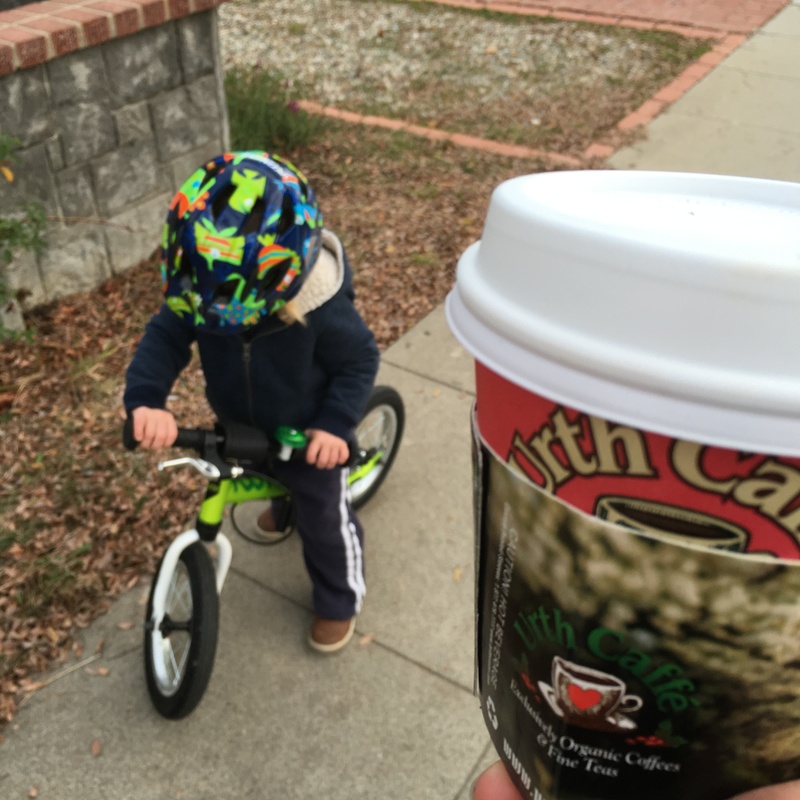 For most, 12 inch tires is the best place to start (if you are getting the bike for a toddler 2-5). Tires also come in air, rubber, foam and hard plastic. Air will run the risk of flat tires, but ultimately offer the best traction and cushioning, whereas EVA foam (usually found on lower-end bikes) will never go flat, but offer very little traction and no cushion. Hard plastic is not a wise choice since it’s really only appropriate for indoor use. Why we chose our bike. I strongly suggest you look at the incredibly detailed comparison chart on Two Wheeling Tots to determine the best fit in bike for your child’s height/inseam, weight and age. What are you going to tell your children?